The Komodo Dragons are monitors that are now restricted to a few islands in Indonesia. 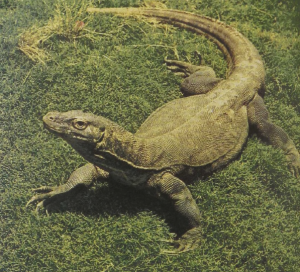 It is hoped that they will be protected there because they are not only the largest surviving lizards, but a truly spectacular group. Their habits have recently been studied and prove to be different from those of the smaller species of the large group of monitor lizards. From the 1 ‘A inch-long eggs these animals grow to a length well over 10 feet, and such large specimens are capable of immobilizing, killing, and dismembering small deer and wild pigs. A 9-foot specimen has been observed to grab a 4-footer and break its back by a single shake of the head. Like all monitors the Komodo Dragon has a curved row of very sharp, backward-curving teeth. Small prey is grabbed and shaken so violently that the body cavity may rupture and pieces be separated off. Larger prey is broken by being bitten while the forelimbs tear and scratch the protruding parts.